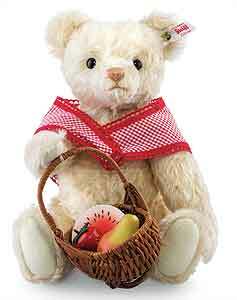 Picnic Mama Teddy Bear by Steiff. This beautiful hand made piece, in vanilla mohair, is fully jointed and wears the white ear tag, signifying this item as a Steiff limited edition, together with the famous gold plated Button in Ear. Limited edition of only 1000 pieces worldwide. Product details: safety eyes, synthetic filling material, non growler, size 30cm. Comes boxed, together with a numbered certificate of authenticity. Ashby Bears proudly present Picnic Mama from the the new Steiff picnic family. She herself really likes fruit in the countryside: lying in the basket are half a melon, strawberry and pear all made of wood. Mother Bear is wearing a plaid shawl, with red laced edging. Her hand embroidered nose in pale pink, makes a nice contrast to the fine, vanilla-coloured mohair. Like all bears in the Picnic family she is limited to 1,000 pieces. And one thing is certain: without her, Picnic Papa would not travel to Provence, not even in his dreams.